Judge Stanwood R. Duval, JR. Please download a list of all New Orleans Division Federal Judges and Clerks. Assumption, Jefferson, Lafourche, Orleans, Plaquemines, St. Bernard, St. Charles, St. James, St. John the Baptist, St. Tammany, Tangipahoa, Terrebonne, Washington. 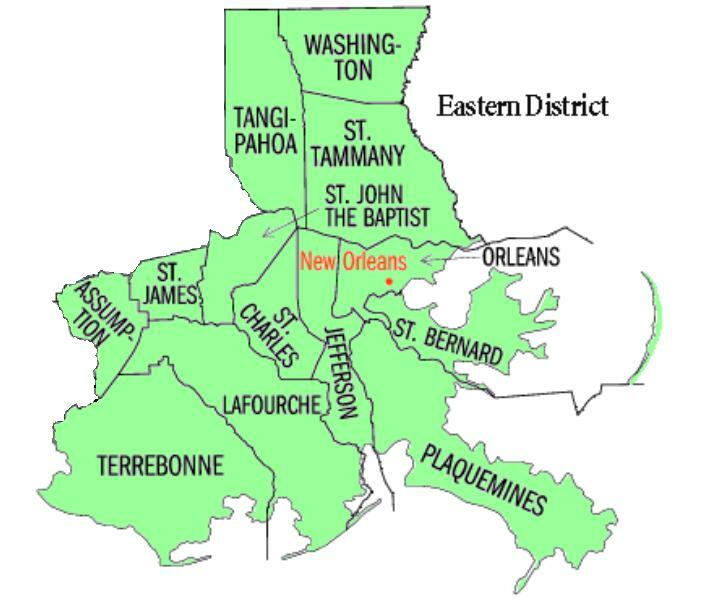 If you wished to appeal from one of the trial courts in the United States District Court for the Eastern District of Louisiana - New Orleans Division, you would appeal to the Fifth Circuit United States Court of Appeals located in New Orleans, Louisiana. Serving clients throughout Southeastern Louisiana, including Bridge City, Elmwood, Harahan, Houma, Jefferson, Kenner, Metairie, New Orleans, River Ridge, and other communities in Jefferson Parish..
Metairie Personal Injury Lawyers are experienced trial lawyers and can represent you in federal and state courts throughout the Greater Metairie area. Contact a Metairie Personal Injury Lawyer today for a FREE INITIAL CONSULTATION.